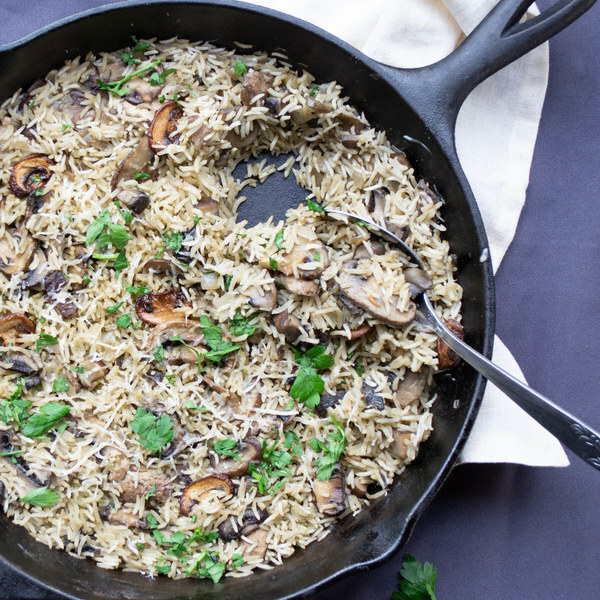 ← Three Mushroom & Parmesan Pilaf. Heat olive oil in skillet over medium heat. Trim off and discard the ends of the shallots; peel and finely dice the shallot. Add to the skillet, stirring regularly. Wash and dry all of the mushrooms. Remove the stems of the portobello mushrooms. Using a spoon, carefully scrape out the gills, making sure not to damage the rim of the mushrooms. Dice into 1-inch cubes and add to the skillet. Slice the remaining mushrooms and add to the skillet. Peel and mince garlic. Add to the skillet. Season mushroom mixture with thyme, rosemary, salt, and pepper. Cook, stirring occasionally, until mushrooms are tender and shallots are translucent, about 5-6 minutes. Using a strainer or colander, rinse the rice under cold, running water, then drain and transfer to skillet. Add broth and bring mixture to a boil. Lower heat to medium-low. Cover with a tight fitting lid and cook without disturbing for 15-20 minutes. Wash and dry parsley. Shave leaves off the stems; discard the stems and mince the leaves. When rice is cooked, stir in butter and Parmesan cheese until melted. Top with prepared parsley. Serve warm, enjoy!